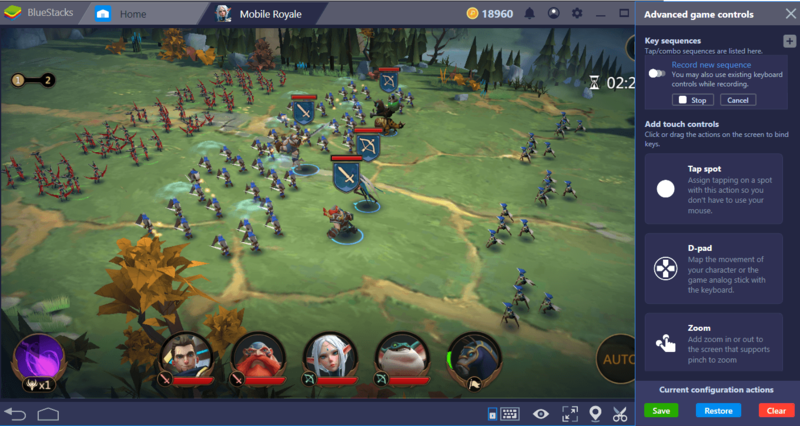 Mobile Royale offers a huge world to conquer and BlueStacks has all the tools you need to make your job easier. With features such as Combo Key, Multi-Instance, and keymapping tool, you can become the most powerful lord this world has ever seen. 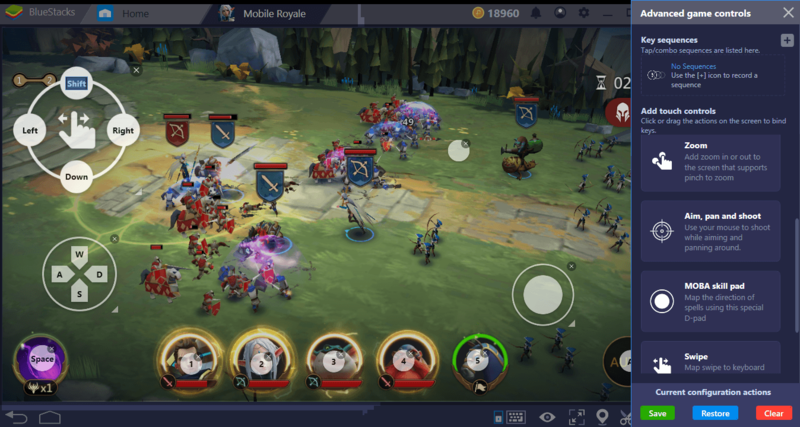 In this guide, we’ll tell you how you can do this and give you some BlueStacks tips for Mobile Royale. Let us begin, my lord, your citizens are waiting for you! 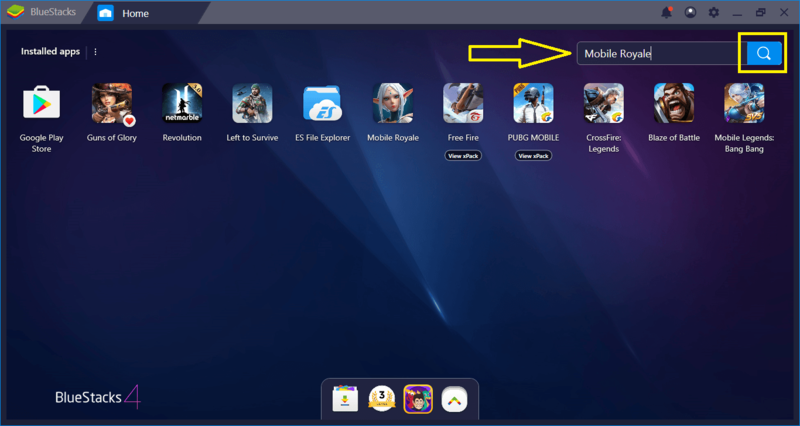 It is quite easy to download and install Mobile Royale – BlueStacks will automatically perform most of the things. There are only two things you need to do: Search the game and press the “install” button. Type the name of the game in the BlueStacks search box and press Enter. Just press the green button. On your screen, this button will be displayed as “install”. The reason it is displayed as “open” on our screen is that we have already installed the game. Mobile Royale is approximately 250 MB in size, so download doesn’t take too long. 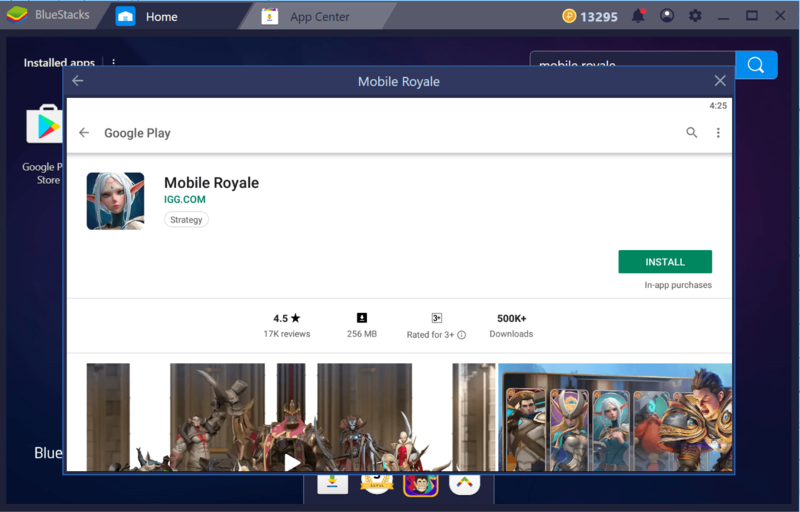 After that, you can sit back and relax: BlueStacks will automatically install Mobile Royale and all you have to do is click the icon of the game and start playing. 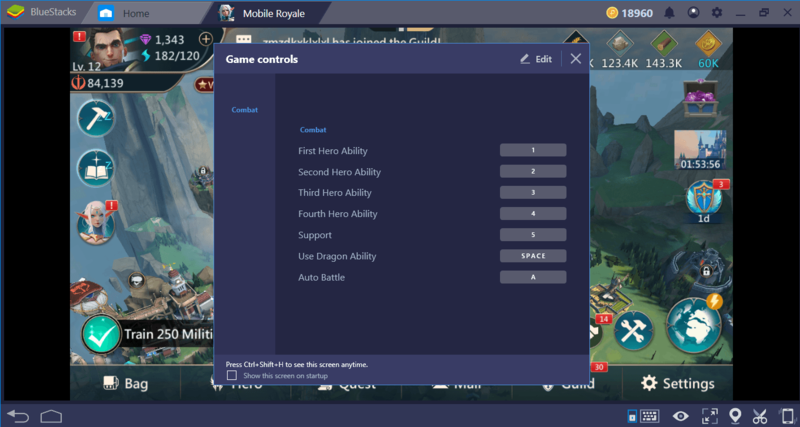 Mobile Royale is a conquest game, so you don’t need a control device other than your mouse. You can manage all the functions of the game with the left and right mouse buttons. However, if you’re playing at a competitive level, it may be a good idea to specify keyboard shortcuts for some features and functions. First, let’s look at what the default control scheme is. Click the icon at the marked place to display default controls. The control scheme includes keyboard shortcuts that you can use only in combat. The reason for this is that, as mentioned above, you can do everything with your mouse. You can click the “edit” button to make changes to this scheme. After you have assigned the desired controls, don’t forget to press the “save” button. Note the advanced settings link at the bottom: We will use it to open the advanced keymapping tool. However, this is not all you can do to personalize the controls: You can define “tap spots” on the screen and create a visual interface. To do this, simply click on the advanced settings link in the default control scheme screen. Using this tool, we can place various functions anywhere on the screen and assign a key to it. You can also change the default controls here. 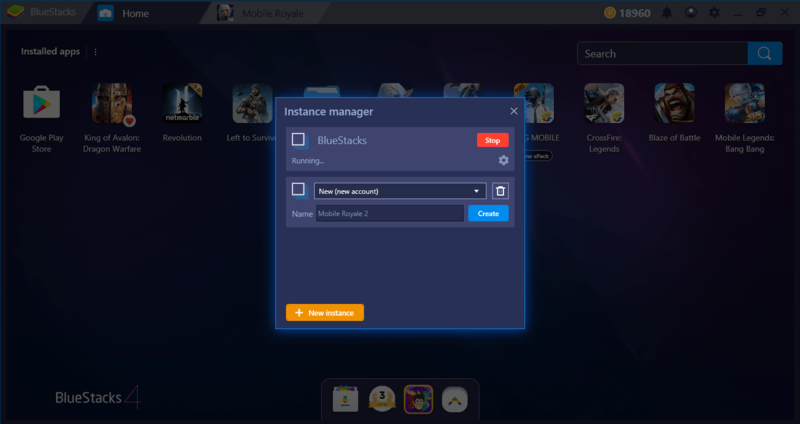 BlueStacks’ multi-instance feature allows you to create multiple accounts and play a particular game with them. 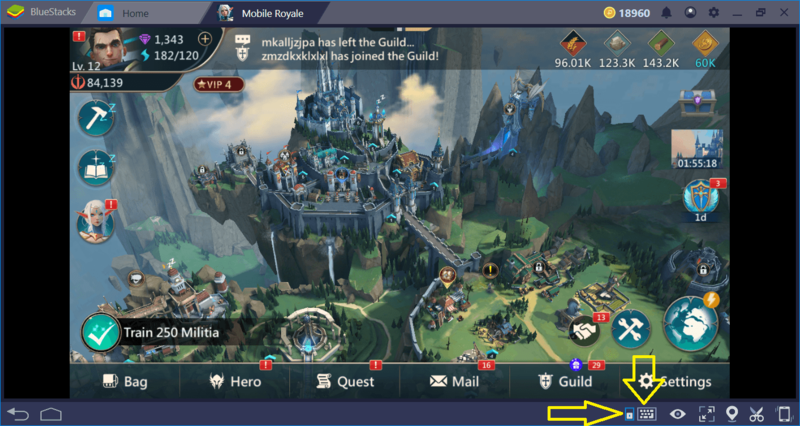 You can do this via one BlueStacks session: Simply click the “Instance Manager” button from the ribbon menu in the main interface. You can launch the Multi-Instance feature here. You can create as many instances as you like. As long as your computer’s resources are adequate, there is no restriction in this respect: You can even play with 10 different accounts at the same time. So, what’s the use of this feature? 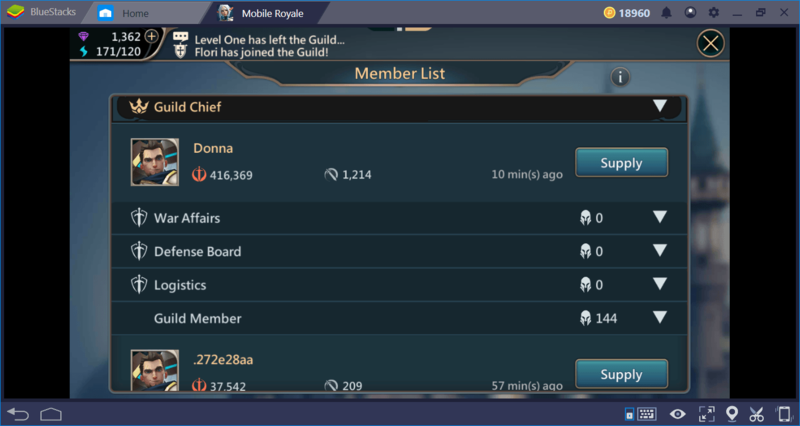 First of all, you can set up a guild of your own and fill it with “members”. The members will be your own accounts, of course. Guild members can send military help and resources to each other whenever needed. So, for example, you can get thousands of troops in a short time when your main city is under attack. But this feature will be extremely useful for resource battles. 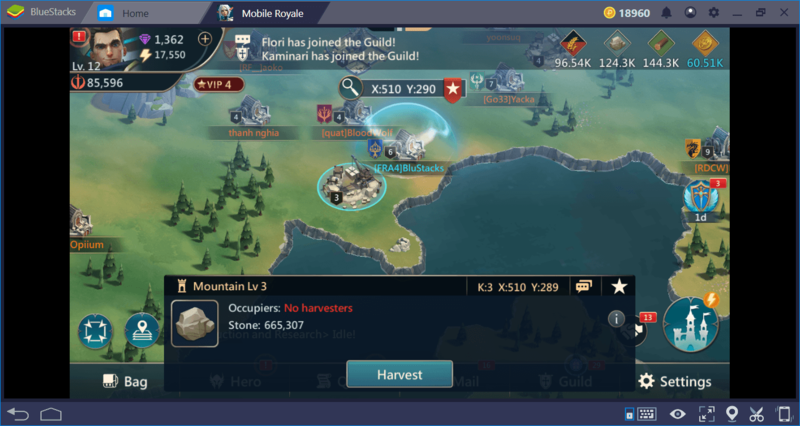 As we mentioned in our review, Mobile Royale has a lot of resources on the world map and you have to constantly fight against other players to control them. If you do this through your main account, your military strength will gradually weaken. However, if you use other accounts to control the world’s resources, the military power of your main account never diminishes. You can send the obtained resources to your main account by the method mentioned above. 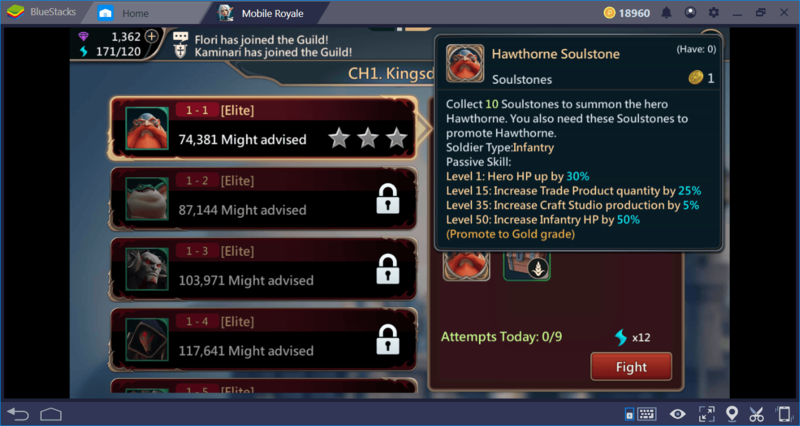 Like many other conquest games, you can repeat the missions you completed in Mobile Royale. You’re going to want to do this as much as possible because repeated missions still continue to reward. In fact, you have to do this to collect pieces of certain heroes. As Mobile Royale battle missions consist of multiple phases, you must spend at least 4-5 minutes each time. If you repeat 5 missions every day, you will spend at least half an hour in vain. Moreover, because the enemies always attack the same way and spawn in the same place, this job becomes boring after a short while. 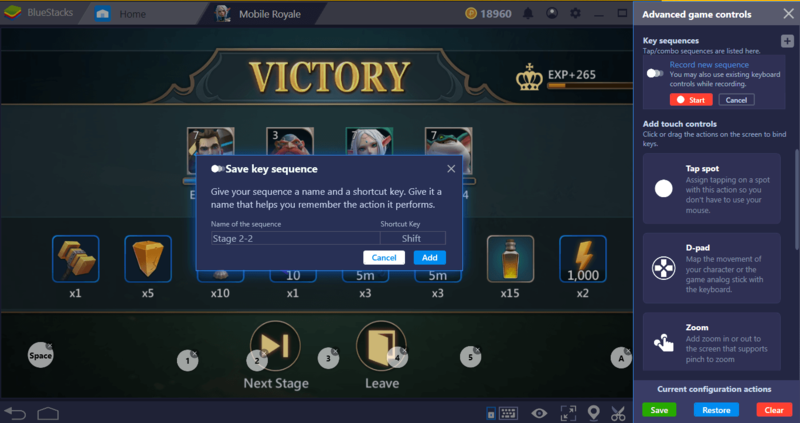 With the Combo Key feature, however, you can turn this into an advantage: Complete a mission, save it, and repeat as many times as you like in the future. No need to play the game yourself, BlueStacks will automatically replay your “visual recording”. Select a mission and start recording. Note that the skills of your heroes can be used in succession to create a combo. If you want, you can also include these combos in the record after learning how to do the most effective ones. Give a name to the record – we recommend that you use the name of the stage you completed for practicality. In the future, you can press the assigned hotkey to automatically repeat this mission. 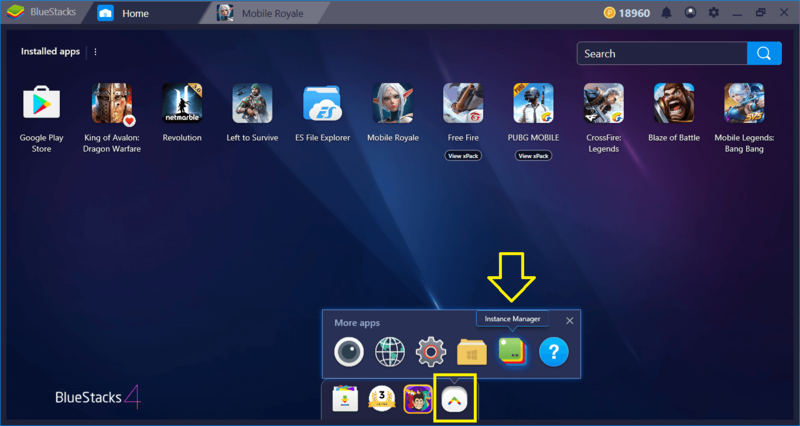 BlueStacks enables you to automate many features of Mobile Royale and save time – so you can focus more on the fun. Thanks to the big screen support, you will also be able to see the battlefield from a much wider angle and understand where you need to use your troops and the skills of your heroes. In short, BlueStacks has all the features and more you need to be a stronger lord. All you have to do is conquer the world! 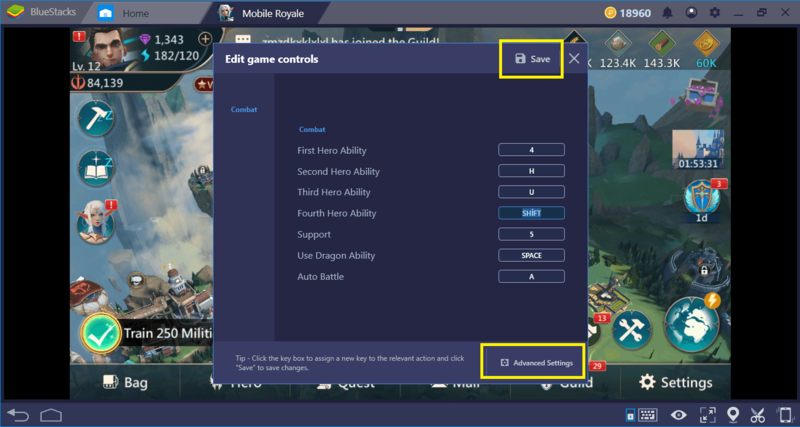 To learn how to do this easily, we recommend that you read our other Mobile Royale guides too. Good luck, my lord, your citizens are counting on you!